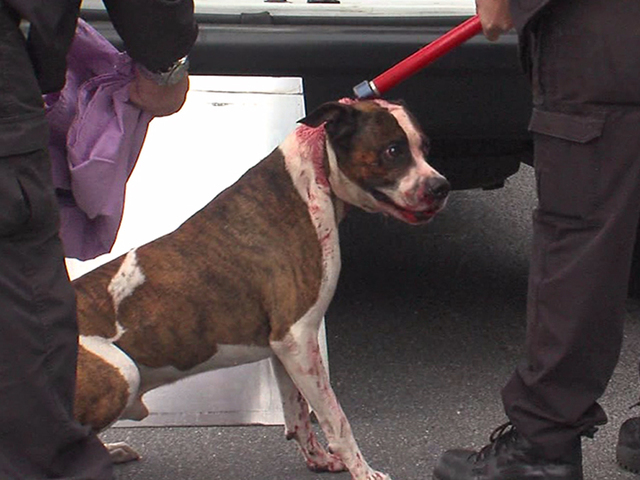 A dog attack sent two people to the hospital in Tampa. According to Tampa Police, a PIT BULL MIX named Scarface bit its owner and two other family members at a home located in the 3400 block of Cord Street on Friday afternoon. Tampa Police said Brenda Guerrero, 52, tried to put a sweater on the dog when it attacked. Her husband, 46-year-old Ismael Guerrero, attempted to pull the dog off his wife when the dog began attacking him. When Animal Control and Tampa Police arrived to the home, the dog was shot with a tranquilizer gun. After the dog got into the house, where there were two children in the back room, TPD officers deployed a bean bag gun and taser to subdue the dog. Eventually, the dog was captured by Animal Control by using a "catch pole." Both Mr. and Mrs. Guerrero were taken to the hospital to be treated for their injuries. Mrs. Guerrero's injuries are believed to be serious, though not life threatening. Neighbors said the family just got the dog about a month ago. They said at times the dog would get out of the yard and run through the neighborhood. "You got kids here, kids there, and if that dog gets out the gate it could be dangerous to a kid," Joe Montgomery said. "But, he never attacked no one on the street as far as I know." At this point it is unclear if the dog will have to be euthanized. There was a comment on one of the news stories about the attack blaming the owner for getting herself attacked as if it were just a natural consequence of putting a sweater on a dog. I guess we need to add putting on a sweater to the list of things known to precipitate maulings. It looks like the low was around 60 for Tampa so "Scarface" & everyone else would have been better off without the attempted sweater dressing but if it hadn't been the sweater it would have been something else. That animal was a ticking time bomb waiting to go off. Pet owners often have to do things that may upset their pets or run counter to the pets' wishes or instincts: baths, leashes, grooming, medication, taking away dangerous items. I hope Scarface isn't given another opportunity to go beserk in someone's home. Scarface, lovely name for a pit bull. Scarface definitely left some scars. Probably too macho for sweaters. I find this situation hilarious! How is it these people that adopt pit bulls have no idea the reputation of these beasts? I find it hard to believe that they are that oblivious. They choose not to believe that pit bulls are dangerous, then find out how wrong they are by trying to put a sweater on one of them. If you want a dog that will not maul you, or put you in the hospital during the holidays, get a Yorkshire Terrier. You know, the other terrier with a fancy sounding name that will not try to kill you and your family when you put a sweater on it, and a bow on its head. All that over a sweater! Good thing they didn't try on the tutu lol!!! Amazing though how many people need to be educated by becoming the victim of their own f@cking pet pit before they understand these really aren't meant to be pets. This story is really making the rounds. Both of my sons informed me of this. I knew about it a day before they did. Did they do a DNA test to prove it was a pit bull? This might be an aberration for those unfamiliar to pit bulls, but this is all too familiar to those of us are. The nutters will try and say all dogs do this. Really? Where are all of the other news stories of dogs trying to kill their families over a sweater? I'd like to see at least one story of a serious attack from a normal dog over a sweater in the last 50 years. They only had the dog a month. You don't get a powerful dog from the pound and try to manhandle him into a sweater. My dog goes in just fine, but I've been doing it since she was a puppy and she's learned it's a lot warmer.